The parlor was the room families hung out in during the 19th century. It was the room in the front of the house that had a couch, some chairs, and other trinkets to make the place look like home. Yet when someone died there were no funeral homes, so the dead were often displayed in the parlor, also known as the mourning room. 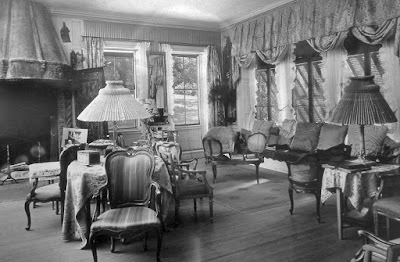 The main function of a parlor was a place to entertain guests. It was decorated with the owners most impressive furniture, decorations, and pictures. It was designed as to impress guests. Yet when a family member died, that person was displayed in this room, and guests were entertained as they came to see the dead person off before burial. During much of the 19th century plagues were a common thing, so dead people often lie in these parlors. Living rooms were a common term during the later half of the 19th century for homes that didn't have parlors. Although larger homes, such as Victorian homes that were popular among the more wealthy class, all had parlors. The word "living room" was not as common during this time as it is today. At the turn of the century there were no plagues for a while, so people quickly forgot how frequently plagues occurred and how quickly they took lives. Yet in 1918, during WWI, the table was set perfectly for a virus to spread around the world. With soldiers fighting in close proximity, such as in trenches, and with good hygiene difficult in battle grounds, the germs spread quickly around the world. People were dying fast, and bodies were placed in the parlors. Some people started referring to parlors as "death room." As the flu started to disappear, America tried hard to forget. Newspapers stopped printing news about the flu. Never before did a plague so quickly disappear, as well as news of it. Experts estimated that as many as 50 million, or even as many as 100 million people died. Now all people wanted to do was forget about all that death. This many people died in a span of 25 months. Compare that with AIDS, which has taken over 50 million lives in a span of 25 years. People wanted to start living their lives again. Around 1918 Ladies Home Journal -- one of the leading magazines at the turn of the century -- came up with the idea of no longer calling a parlor a parlor. So it postulated the idea of calling the "mourning room" the "living room" instead. This was an idea that quickly caught on. The place where families hang out should be associated with the "living" more so than death. Ever since then the term "parlor" slowly declined and "living rooms" rose.